. : About :: Mar de Cortés International Airport :. 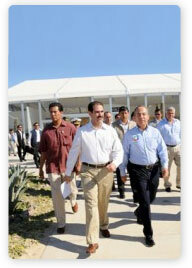 The Peñasco’s Airport has experienced a number of stages of growth. 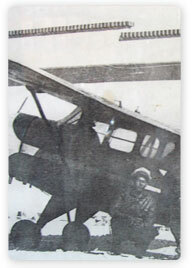 The first airfield it was founded during the 1940s when "Mexicana de Aviación" inaugurated its route Mexico City-Mexicali, with a stopover in Puerto Peñasco. The airport consisted of an office with a telegraph operator who provided information about route conditions. The second airfield was built in 1973, with a small terminal building. On August 5th, 1994, it was declared port of entry by the then president of Mexico, Carlos Salinas de Gortari. This benefited pilots landing in Puerto Peñasco, who, prior to that, had to clear customs and immigration in Nogales, Sonora or in Mexicali. On September 28th, 2005, a new phase began and may we say the most significant in the development of Peñasco’s International Airport. With the financial help of Mayan Resorts Group, an important investment was made in order to improve the airport facilities, such as the repaving of the runway and ramp; the enlargement of the air terminal and car-park area; the construction of the AFF station; fencing around airfield; and vertical and horizontal signage, among other improvements. With these changes, increased safety was achieved regarding airport operations as well as more security according to international standards around the airport. Those improvements were necessary to continue operations at this airport while a new commercial airport was being developed and built. On September 20th, 2006, the Mexican Federal Government issued a concession title to Aeropuerto del Mar de Cortés, S.A. de C.V., a company which shareholders are the Government of the State of Sonora and Operadora Aeroportuaria Golfo de Cortés, S.A. de C.V., a Grupo Vidanta Company. On February 1st , 2007, breaking ground of the new airport was achieved. On October 27th, 2009 the old Rocky Point Airport was closed ending one of the most important stages of the city of Puerto Peñasco and local history of aviation.